The upshot of all this is that I tend to only show the good bits of my work: the neat little sketches with potential, the studio shots where I look in control and am not squinting at the camera in a confused leer and, most of all, finished prints. For a change I thought I would show you some heart ache. Things don’t always go well and this print has been a really good example of what can go wrong. Inevitably this was the last print in the series of fourteen due for my client with a deadline looming and almost as inevitably I developed a head cold featuring a dangerously drippy nose at the same time. Japanese woodblock relies on a series of registration slots called Kento. These slots are cut by chisel onto the wood along with the block for printing and are crucial to lining up all the layers of the print into a full coloured picture. They act as a guide and the printing paper fits into them and is held in place to take the impression. Get any of the Kento slots a couple of mm out and the picture will be wonky. The print here has 18 different Kento slots (some of the blocks share a Kento, there are roughly 45 to 50 different woodblocks for this picture) and somewhere along the line I was out of sync. Trouble is that it isn’t until I start printing that the problem becomes clear and even then it is seldom obvious just which kento is the problem and with several blocks sharing a kento, it could be just one of them that is out of line. The paper doesn’t make things easy either: it must stay damp, consistently the same damp, or it changes dimension. The bigger the print, the bigger the distortion. 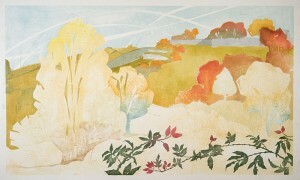 This print is 120cm wide and the paper can change by as much as 4mm as it dries. It’s easy to control if all goes to plan, but have a head scratching crisis of alignment and the paper is against me, drying out as I try to see the break in the chain of Kentos and adding to the confusion. In the end I did manage to get a finished print without the benefit any drips from my leaking nose, but it was a nightmare. I would love you all to think that I have everything under control and things always go to plan, but it’s not the case. I do get caught out, as I have here, and I am far from perfect. It’s just that I tend not to talk about it much! You are unbelievably brave to admit to mistakes. Most people would hide their errors and allow the world to believe in their perfection. I admire you all the more for owning up to being less than perfect but I put this particular one down to your having a bad cold because I prefer to believe in your perfection. Just thank God it wasn’t what the Queen had. You can’t have gastro entiritis until you install a loo in the studio! Oh, I’m sure all artists, whatever their field, have similar stories! My carpenter father always said “measure twice and cut once.” I do, but still go wrong sometimes. I thought the work that was spoiled was still beautiful. Thank you for sharing your foibles. You talk about Kentos here and registration always kills me. I’ve tried several registration methods but still struggle every time. Would you please describe your wooden registration frame that you said your husband made for you and how it works. (In detail please) I just have so much trouble with this and I’m never sure why. 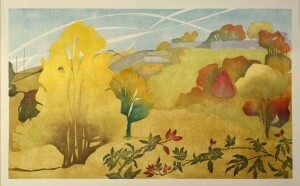 My one color etchings with aquatint are beautiful, but when I try any sort of registration for color, I want to cry. Previous Previous post: But is it Art?